Robots and workers of the world, unite! Robots are already changing the way we work – particularly in factories – but worries that they will steal our jobs are only part of the picture, as new technologies are also opening up workplace opportunities for workers and are likely to create new jobs in the future. Last year, the BBC reported that 800 million global workers will lose their jobs to robotic automation by 2030. This statistic, from a McKinsey Global Institute study, led to countless headlines asking, will robots take your job? The study found that robots will eliminate some jobs, but also create new ones. As the field develops, European roboticists are busy investigating how factory robots could create new opportunities for workers in manufacturing jobs. The MANUWORK project is collaborating with non-profit group Lantegi Batuak in Spain, which helps to incorporate people with disabilities into the world of work. The project scientists are testing a number of assistive technologies including augmented reality (AR) displays that can help workers with disabilities in complex tasks such as the assembly and wiring of electrical cabinets. The display shows step-by-step wiring instructions to the worker. ‘We want to introduce a robot to work with them in the assembly process, to indicate cable connections or do some quick quality checks,’ said Dr Kosmas Alexopoulos at the University of Patras in Greece, who coordinates the project. This kind of human-robot collaboration technology could allow greater involvement of people with disabilities in manufacturing roles across Europe. Predictable physical work in factories plays to the strengths of robots, but even the most modern factories are not run entirely by machines. European car manufacturing is leading the way in adopting robotics. Last year, the number of robots in French car factories rose by 22% to 1,400 units, with around 9 robots for every 100 workers. 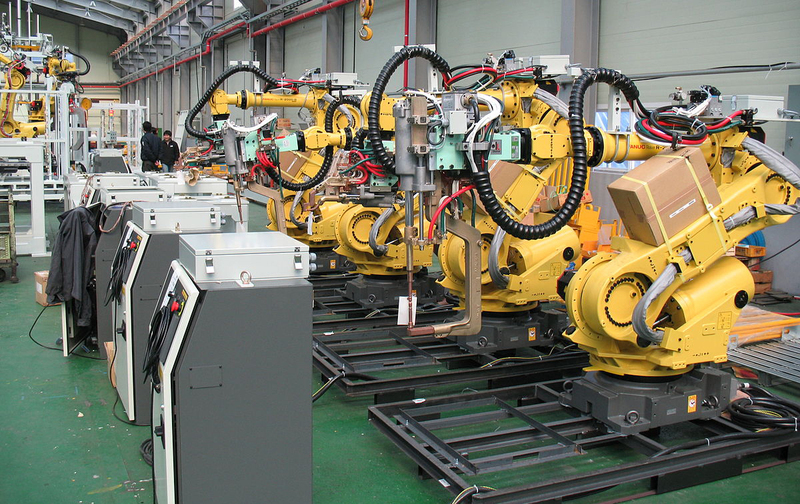 Robots are used heavily for the assembly of cars, mainly for body welding and positioning of large metal parts. Later, the skilled human labour comes in to create the interior. ‘Assembling car interiors is complex and it requires the skills of a human to perform,’ explained Dr Sotiris Makris, industrial robotics expert at the University of Patras. His industrial robots lab in Patras took a leading role in a project called ROBO-PARTNER, which aimed to safely mix people with robots operating in the same workspace to perform a car assembly task. Under normal circumstances, close man-machine teamwork is not possible because robots and humans are kept apart for safety reasons. The human worker brings intelligence and fine skills, while their robot buddy delivers super-human strength and precision. The team took a real-life scenario as a starting point. In an automobile factory, the rear axle of a vehicle – which can weigh over 50 kilograms (kgs) – must be brought into position by a worker. They must secure the part and then fit drum brake components, which also involves heavy lifting and manipulation of flexible wire parts. ‘The worker carries the drums, mounts them and must screw them in place. It is quite a stressful process, both physically and cognitively,’ said Dr Makris. The project developed a robot, capable of lifting 130 kgs, to move the axle and brake parts into place for the human worker. Importantly, the worker remains in the vicinity as the robot – essentially a powerful arm that can move around and grip and lift items – manoeuvres the car parts into position. At present, one particular 14-kg part for the rear wheel must be lifted 500 times in a single shift by car assembly workers, but the robot could shoulder this strenuous work. This would mean physical strength would no longer be a reason for someone not to do this job. Video cameras, sensors and adjustable safety zones prevent the robot from moving dangerously close to the worker. The worker interacts with the robot using a control panel, but also uses virtual reality (VR) glasses that visualise the next task for the worker. The completion of each task is signalled using a smart watch and the human remains in charge. Dr Makris is optimistic that such research will allow people and robots to work side-by-side. There will be new jobs too. Factories of the future will create new roles, such as safety engineers, robot specialists and AR experts, Dr Makris predicted. Robots are also being used to transform warehouses for online businesses, which are currently divided into two areas. In the centre, wheeled robots shift shelves around and move items to the perimeter, where human workers are waiting. The workers and robots are kept apart for safety. A laser barrier detects any unauthorised entries by people, which will cause the system to shut down. In the case of a robot failure, the warehouse has to be stopped so a service technician can do repairs. But what if robots and people could safely tango together in warehouses? This is the vision of SafeLog, a project that is developing a flexible warehouse system where humans and automated guided vehicles safely share the same space. ‘With SafeLog, the service technician could just walk in the warehouse and fix the robot, so the warehouse could stay online,’ explained Professor Björn Hein, robotics engineer at the Karlsruhe Institute of Technology, Germany, and coordinator of the project. Right now, there are usually a few dozen robots, so downtime is not a significant issue. As numbers of robots start to increase, downtime could start to be a problem. SafeLog is creating a safety vest to be worn by warehouse workers. This wirelessly transmits the worker’s location and can be detected by robots nearby, so that they will sense if a human is too close and stop. For coordination, SafeLog scientists are developing algorithms that track and predict the movements of people using the vest and robots. This would be used by a fleet management system, the silicon brain that will safely guide hundreds of robots around a warehouse. The workers will wear smart glasses that will warn them about objects close by and help guide them to items in the warehouse. ‘We intend to make it possible for warehouses to become even bigger, because allowing robots and humans work together adds flexibility and makes it easier to extend,’ said Prof. Hein. The SafeLog system will be put through its paces in a real warehouse in early 2019. All research in this article is funded by the EU.